The German media company Bertelsmann, owner of the famous Archivio Storico Ricordi, and Ricordi & C. stage an exhibition-event dedicated to the world famous Italian composer. 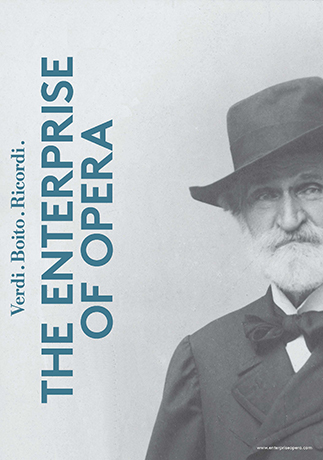 The exhibition investigates the professional and personal relationship between Verdi and two key-personalities of the cultural panorama of the time: the librettist Arrigo Boito and Giulio Ricordi, Verdi’s publisher and principal maker of his international success. The exhibition focus on Verdi’s last two operas; the dramatic masterpiece Otello (1887) and the immortal comedy Falstaff (1893). Their development is superbly documented in the Archivio Storico Ricordi. Focusing on the three personalities of Verdi, Boito and Ricordi, the creative process of the making of these two operas is mapped using an original score, manuscript correspondence, stage sets, costume designs, photographs, and further unique exhibits from the Archivio Storico Ricordi. The exhibition provides fascinating insights into the world of Giuseppe Verdi: a highlight and treasure trove not only for professionals or those who are already opera enthusiasts, but for everyone with a love for music and an interest for its history.